The Kavanaugh Hearings and Dr. Christine Blasey-Ford’s testimony galvanized sexual assault survivors and their supporters, sparking demonstrations across the U.S. and beyond. Cautious optimism was palpable when Senator Jeff Flake announced his confirmation vote would be conditional to the FBI investigating claims of sexual assault. That optimism evaporated when it became clear the FBI was working within a limited scope, interviewing neither the accuser, nor the accused, nor dozens of people who attempted to come forward with corroborating information. Kavanaugh, who called the allegations against him a ‘Democratic conspiracy,’ would be confirmed anyway. In a time when so many citizens are feeling the consequences of populist governments and more seem to be coming to power, where can people channel their anger and frustration? The ballot box! From Kerry Washington to Willie Nelson, celebrities and activists are using communications campaigns to get people to vote in the midterms — and similar movements, targeted at both liberals and conservatives, are happening all over the world. 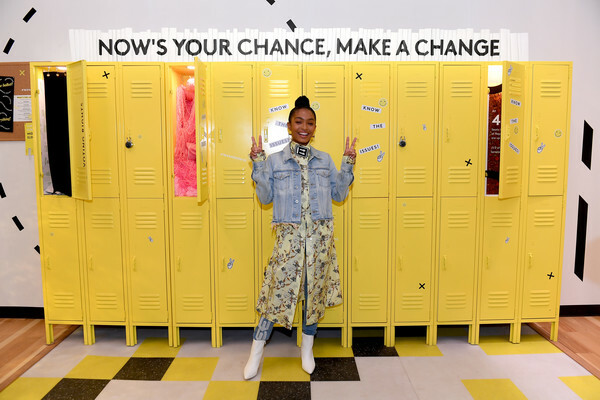 Grown-ish actor Yara Shahidi teamed up with activist Michael Skolnik to host the #WeVoteNext Youth Summit in the TOMS shoes HQ in Downtown LA. Rather than resorting to the pejorative messaging of the past (“vote for the government you want or get the government you deserve,”) #WeVoteNext focused on how to bring positive change to the American voting landscape. The movement seeks to mobilize the nearly four million young Americans who gain the right to vote every year, and fight back against the current administration’s attempts to erode voting rights. Speakers included actor and Voto Latino founder Rosario Dawson, who discussed how the legacy of colonialism is living on through gerrymandering and purging voters from polls. Black Lives Matter Toronto co-founder Future spoke about how the establishment benefits from framing young black and brown voters as narrow-minded and unreliable. Actor and trans-rights activist Laverne Cox underscored the difficulty trans citizens have in voting when their government doesn’t allow them to update the gender on their ID, and how these difficulties are compounded when those citizens are also black and poor. Despite dealing with depressing subject matter, the summit focused on empowerment, and mobilizing young people to advocate for themselves. Two provinces in Canada recently elected right-wing populist premiers, Doug Ford in Ontario (Americans might remember his late brother Rob, former mayor of Toronto who was caught smoking crack on video), and François Legault in Quebec. In the case of Ontario, former Premier Kathleen Wynne’s deep unpopularity sparked the rise of Ontario Proud, a right-leaning Facebook group with over 400,000 likes, and which clocked 6.7 million minutes of video views in the lead up to the provincial election. The group had street teams out to encourage Conservative voters to make their voices heard, and their tactics worked — the Conservatives went from 27 seats to 76, enough to form a majority government. Voting rights for people who’ve had interactions with the justice system vary by state in the U.S., but four of them (Florida, Iowa, Kentucky and Virginia) ban ex-felons from voting in perpetuity unless the governor restores their rights. The implications for Floridians are particularly stark — 1.69 million are unable to vote, many for past convictions as trivial as tampering with a lobster trap. Enter Desmond Meade and Neil Volz, an activist odd-couple of sorts who don’t have much in common aside from their disenfranchisement due to felonies. Meade had a gun possession charge, but after prison, went on to kick a crack habit, earn a law degree, and head the Florida Restoration Rights Commission (FFRC). Volz is a former Republican lobbyist who accepted kickbacks in exchange for access to his boss, Rep. Bob Ney. After he’d served his sentence (two years probation), Volz saw Meade speak at a university and realized scores of Republicans were disenfranchised, too. He joined FFRC as a volunteer and collected signatures at Trump rallies for a petition to get the Voting Restoration Amendment — which restores voting rights for all ex-felons except those convicted of sexual offenses or murder — on the 2018 ballot. Combined with Meade’s travels around the state to drum up signatures, they got the required 800,000 and amassed a diverse collection of allies, from the ACLU to the Christian Coalition to John Legend. An advertising campaign for the bill features Republicans, veterans and former opioid addicts seeking to reframe how Floridians think about ex-felons. An early poll shows the bill passing with 74% support in the heavily conservative state. Another Round: Courtesy of Buzzfeed, Another Round’s hosts, Heben Nigatu and Tracy Clayton cover everything from race, gender and pop culture to squirrels, mangoes, and bad jokes, all in one boozy podcast.